The U.S. National Junior Team’s run to the gold medal was an improbable one. Coming into the tournament it seemed as though the U.S. was going to have a tougher time matching up with the top teams despite its now typically strong group. As is the case for any championship team, certain things had to go right. A lot went right for Team USA this year, but it wasn’t a cakewalk to the title. A pair of preliminary-round losses put everything in jeopardy. It really could have gone the other direction after that, but the players and coaches made some key adjustments to ensure it didn’t. Coming up after the jump, a look at the five biggest reasons Team USA won as well as a quick look back at how Team USA answered the five questions dogging them coming into the tournament. Though singling out this line, its inclusion on this list is more symbolic of the designated roles for Team USA and commitment to team defense. This line, featuring Cole Bardreau at center, Blake Pietila at left wing and Ryan Hartman on the right wing, had been together before Team USA even left its pre-tournament camp in New York. They stayed together the whole tournament and from start-to-finish was Team USA’s most consistent line. Often receiving the tough checking assignments against top scoring lines, they gave every unit they played trouble. They played with energy and physicality and showed the value of building roles into a team for tournaments like this. This group saw a lot of ice time in key situations of games and even provided some offense from time to time. Whether it was shut-down D, penalty killing, an aggressive forecheck or bringing some physicality, this line fit its role expertly. A big reason Team USA had so much success was because everyone did the job that they were asked to do. Perhaps none of the forwards did it better than this trio. How teams handle adversity can make all the difference. The loss to Russia was a hard pill to swallow. The U.S. had one defensive breakdown late and it led to the game-winning goal, but the offense was sputtering. Team USA went into the Canada game with very few changes to the lineup and ended up getting the same result. Though they lost to Canada in the prelims, the U.S. was a different team from the first period on. They had a great third period, but couldn’t get that game-tying goal. They showed for two-thirds of the game that they could compete with the tournament’s most stacked team. Finding that complete effort was all that was missing. The two losses put Team USA’s back against the wall and the players answered the call. Facing four consecutive elimination games, the U.S. scored 24 goals and allowed just five the rest of the tournament. Whether it was urgency, desperation or maybe just some good ole fashioned anger, Team USA was a different team after those two losses. Team USA’s defense as constructed did what it was supposed to do. After some mid-tournament adjustments, it found the right balance. Jacob Trouba and Jake McCabe were both named to the tournament all-star team and Trouba earned the directorate award as the tournament’s best defenseman. Trouba, Seth Jones and McCabe also finished Nos. 1, 2 and 3, in defenseman scoring with nine, seven and six points, respectively. Team USA’s D accounted for 10 of Team USA’s 34 goals and were a big reason the squad only allowed nine. Their ability to support the perceived lack of scoring depth helped a lot. This was always going to be the strength of the team, but in the end it had to perform up to that ability. They weren’t perfect in the tournament, but they got the job done against Canada and Sweden, two of the most skilled teams in the WJC over the last several years. The D also included the leadership core of the team. Jake McCabe received rave reviews for his work as team captain. Good leadership helps a lot in this tournament. McCabe on and off the ice got the job done and as a result was the first to lift Team USA’s trophy. Making changes over the course of a short tournament like the WJC is never easy. Getting better every game is the goal when working with unfamiliar teammates. Building chemistry and keeping things consistent is usually the best way to accomplish that. This time however, Phil Housley had to make some significant changes to his roster when the offense couldn’t seem to get enough established against Russia and Canada in the prelims. He also had to make some decisions about player usage that were far from obvious. 1. Flipping Jake McCabe and Mike Reilly. Reilly had been playing on the top pairing with Seth Jones, due in large part to his ability to create offense and his good speed. McCabe was on the third pairing with Connor Murphy, being utilized somewhat as a shut-down pair with average minutes per game. Reilly and Jones were struggling as a pair and were on the ice together for some crucial goals against in the losses to Canada and Russia. After the first period of the Canada game, Housley moved McCabe up with Jones and Reilly down with Murphy and it made a world of difference. McCabe seized the role and ended up being one of the best defensemen in the tournament going forward. It made Jones better, too. Jones was better able to establish his offensive presence, but when he and McCabe were out, opposing forwards had a rough time getting anything accomplished. The move also helped Reilly, as it took pressure off of him to play the top minutes and gave him a chance to take some more chances up ice and he was more effective offensively with Murphy. 2. Benching Rocco Grimaldi. That decision was extremely interesting. Grimaldi didn’t play a shift against Slovakia, which allowed Housley to give Jimmy Vesey a shot with the top line and put Vincent Trocheck on the power play for the first time. Vesey clicked with J.T. Miller and Johnny Gaudreau and had three assists in that first game. He brought balance to the line so it wasn’t just three top guys trying to do everything. He played a role and was happy to get the puck to his teammates first. Vesey’s goal against Canada that ended up chasing Malcolm Subban just about iced it for Team USA. Trocheck made that top power-play unit Team USA’s most deadly since the tournament began. They put up seven goals in two games and just had effective shifts almost every time out. Grimaldi meanwhile came back from the benching the way you’d hope. He joined the Trocheck and Tyler Biggs line and gave them a spark offensively. The line accounted for all three goals in the gold-medal game after very little production earlier in the tournament. Credit to Grimaldi for bouncing back the right way. He was one of Team USA’s best forwards after that. Those two adjustments sparked a chain reaction that changed Team USA’s identity going forward and changed the tide of the tournament. The tournament MVP was good for the entirety of the tournament. Even in defeat he was Team USA’s best player. He set the American record for best WJC save percentaged with a .955 mark and his 1.36 goals-against ranks third all-time for an American. It was one of the best goaltending performances you will ever see in the World Juniors for a player from any country and without him, the U.S. doesn’t even come close to gold. As good as the defense was, Gibson still saw a lot of shots over the course of the tournament. He made 193 saves in seven games, including several big ones. He made two momentum-stealing saves against Canada’s Ryan Strome with his glove, including one from point-blank range that would have given Canada new life with the score at 3-0 at that point. A two-goal deficit would have been much more manageable for a motivated Team Canada. The save of the tournament however came against Viktor Arvidsson in the gold-medal game. The lunging pad save on the wraparound kept the U.S. ahead 2-1 and put Sweden on notice. It was going to take something ridiculous to beat him the rest of the way. Who knows what happens to that game if it gets tied at that point. 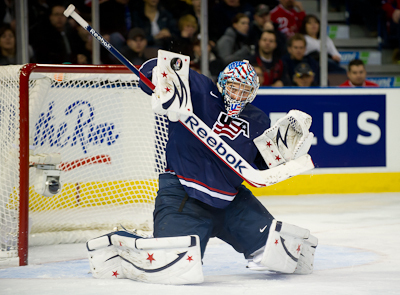 Gibson became the fourth American goaltender to claim the directorate award as the tournament’s best at the position and stepped well out of the shadow previously left by Jack Campbell, to whom he was always compared as the goalie a year behind him at the NTDP. Due to his play from the moment the puck dropped, he was the constant presence the U.S. could rely on. He played every minute but 20 for Team USA at the World Juniors this year. He wanted redemption after last year’s tough game against Finland and he got it. Without John Gibson, Team USA doesn’t win gold. Now a quick look back at the five questions I thought Team USA had to answer over the course of the tournament. 1. How was this team different than 2012? How does “in every way” sound? From the adjustments made by the coaching staff to the mentality of the players. This team walked in with a businesslike attitude and responded to adversity in ways last year’s group could not. They only had three returnees from last year, but 2012 showed talent doesn’t mean everything. On paper, the 2012 squad was much better up front, as good in goal and not quite as good on D. The 2013 edition’s approach appeared to have made all the difference. 2. What kind of coach is Phil Housley? He made the adjustments that helped lead the team to gold. The players believed in him and trusted him, which makes such a huge difference in these short tournaments. Housley’s adjustments were not obvious, but they ended up being the right calls. Tactically, the team never deviated from the game plan. They played the game with speed, but the commitment to team defense is what helped the U.S. take control of games in the latter half of the tournament. So what kind of coach was Phil Housley for this team? The right one. 3. Where will the scoring come from? With the team built in a top-six, bottom-six style at forward, there was concern that the team would struggle scoring. The ended up scoring 34 goals as a team. Ten came from the defense, 24 from the forwards. Every single player had at least one point, including Gibson who had two assists. The defense stepped up in games they needed to with the offense, none bigger than Jake McCabe against Canada. The two games where Team USA didn’t score caused concern in a big way. Jacob Trouba scored the only goal in those two losses, so the forwards went south. Then, after Housley’s adjustments, in the three games between the two prelim losses and the gold-medal game, the top line produced like a top line. In the gold-medal game, it was one of the bottom six lines that took care of the scoring. In the four games after the two prelim losses, the scoring came from everywhere. 4. Can John Gibson put the team on his back? SEE: Reason No. 1 above. 5. Does this team have what it takes to win gold? Coming this week on the World Junior Rewind: Complete reports for all 23 players broken up into two posts (Forwards and Defensemen/Goalies). Also a look at what the victory means for USA Hockey going forward. Lastly, some thoughts on the candidates for 2014, who now have a title to defend. Great analysis! I have a question, though. Maybe two. When the 2010 men’s Olympic team was preparing in the summer of 2009, they were paired up with US military veteran mentors as a form of psychological preparation. The approach was that our team was going into hostile, enemy territory. They were being prepared as a combat unit who had to watch each others’ backs and operate as a cohesive unit. Even with all this psychological preparation, they didn’t expect to get past the preliminaries, let alone what they did accomplish. Considering the toxic situations our junior teams have increasingly found themselves in, is USA Hockey doing anything to help these young men (and women) counter this?